The distribution of the above-ground and below-ground biomass of Scots pine in southern Finland were investigated in trees of different ages (18–212 years) from two types of growth site. Secondly, some structural regularities were tested for their independence of age and growth site. 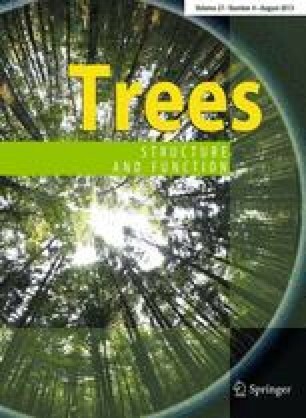 Trees were sampled from dominant trees which could be expected to have a comparable position in stands of all ages. All stands were on sorted sediments. The biomass of the sample trees (18 trees) was divided into needles, branch sapwood and heartwood, stem sapwood and heartwood, stem bark, stump, large roots (diameter >20 cm), coarse roots (five classes) and fine roots. The amount of sapwood and heartwood was also estimated from the below-ground compartments. Trees on both types of growth site followed the same pattern of development of the relative shares of biomass compartments, although the growth rates were faster on the more fertile site. The relative amount of sapwood peaked after canopy closure, coinciding with the start of considerable heartwood accumulation. The relative amount of needles and fine roots decreased with age. The same was true of branches but to a lesser degree. The relative share of the below-ground section was independent of tree age. Foliage biomass and sapwood cross-sectional area were linearly correlated, but there were differences between the growth sites. Needle biomass was linearly correlated with crown surface area. The fine root to foliage biomass ratio showed an increasing trend with tree age.